It’s very strange that this conversation will happen today when Arashi released the goods for the LOVE concert tour. Since 2006, I have been buying “stocks” from Johnny’s, stocks being concert goods. 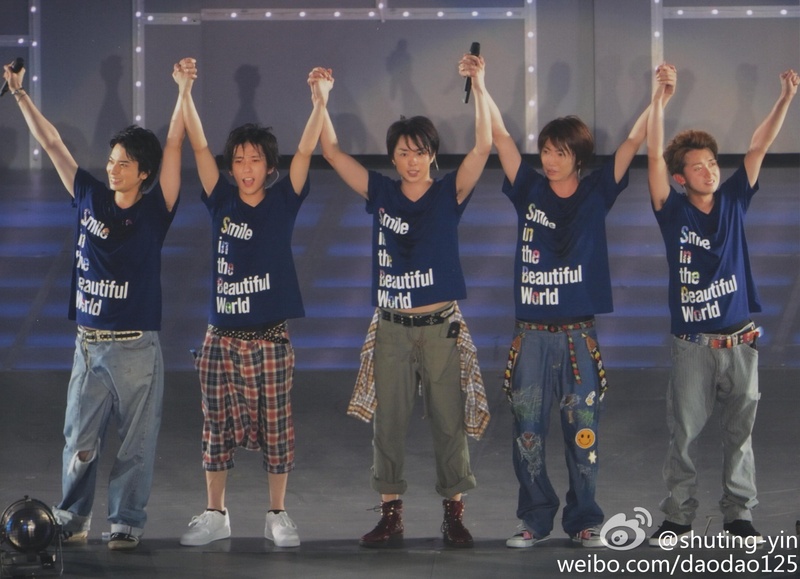 I’ve always bought the shirt except for the BEAUTIFUL WORLD tour (I found it too plain and unimaginative). No regrets. Then in 2007, I was in Tokyo when they did their TIME tour and while I couldn’t get tickets (even at a time that it was still possible to buy it at Lawson’s I think), I went to Yokohama to buy the goods. It’s really different when you’re buying it online from a seller and when you’re right there with the goods right in front of you. I ended up buying not only the shirt but the jumbo uchiwas of all five (that I had to handcarry because I didn’t want them to be squished in my luggage), a cute mug that I haven’t used until now, a phone strap (not used either), pamphlet and god knows what else. Buying goods is serious business when it comes to fans. It’s easy to just want to buy everything because these goods are really meant for the fangirl market and there’s some fangirl psychology at work in there. Uchiwas – How many uchiwas do I need? I live in a tropical country and the summer months are torture but for sure, I’d get weird glances if I haul an uchiwa out for use with the giant face of, say, Matsumoto Jun, there. Photos – I’m not really a big fan of collecting photos and I prefer them digital, no worries on preserving them properly. I won’t even mind if JE would sell photos for download in the future, and I think in an increasingly digital world, this is a worthy consideration. 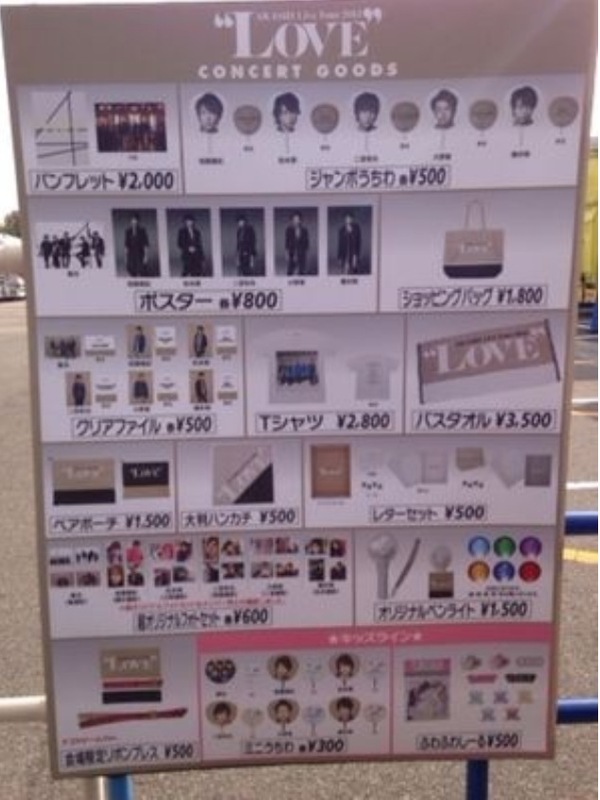 Bags/pouches – I am very tempted to buy the LOVE tour edition. The colors–subdued, also boring–are exactly my taste. But… but… but just how many bags do I need? 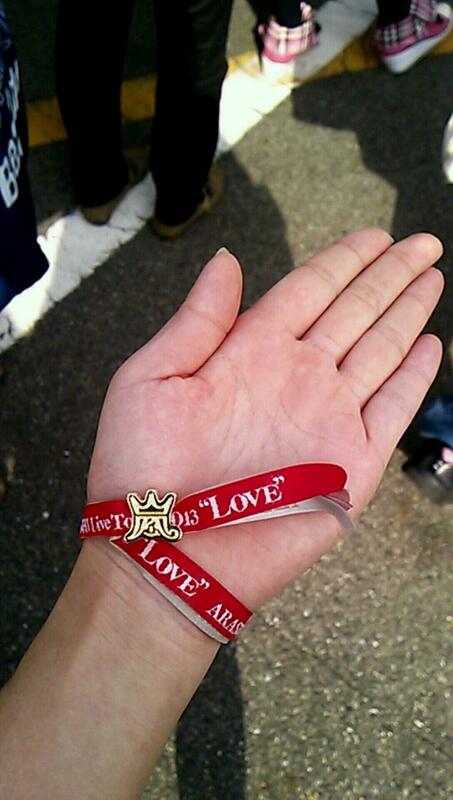 Ribbon – A new invention by JE’s merch designers. Will go perfectly with those Christmas gifts maybe. The logo is cute though. Penlight – These things are actually very useful. 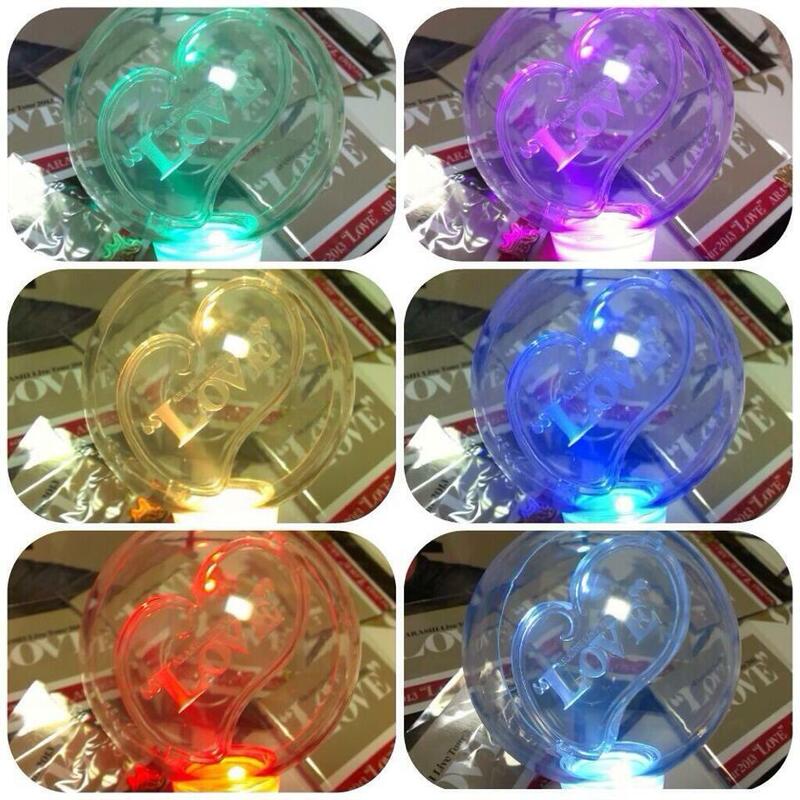 I once used a Jay Chou penlight when there was a sudden power interruption. But not this LOVE edition. I wish I bought the one with the Arashi kanji before. Shirt – This, I can’t say no to. It’s the only concert merchandise that I’ve been buying consistently. Even if this tour’s edition is fugly. It’s the first time they have used a photo for their shirt and as some said on Twitter, it seems they didn’t have time to come up with a design and ended up with this… monstrosity. It’s not really that bad. It just reminds me of those American rock band shirts that you can buy at nightmarkets. 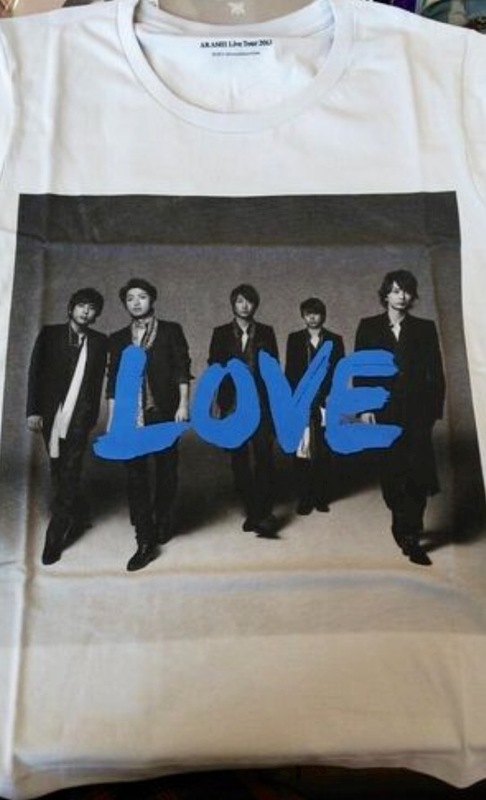 The thing with Arashi’s concert shirts, they do not give that mass-market feel or that common look. And I do wear them, they’re my favorite weekend wear and over the years they have improved on the fabric (I like Arafes ’13 the best) but what’s with this? Having said, that, I’m still buying it. Pamphlet – I’m buying mainly for the New York photos. I like behind-the-scenes and seeing Arashi out of their TV shows or stages, in ordinary clothes (and yet still manage to have that special we’re-celebrities-aura). This is one of those rare times that I’m buying more than the shirt. There goes my money, Johnny-san, happy to do business with you! If only my colleague knows where my money went instead, but company shares are still more expensive than Arashi merchandise. Who said you can’t buy happiness? I just did. You? Totally agree on the pamphlet’s. They’re all looking soooo happy (esp J!). After all, spending time together with all of them (as in complete set) is a rarely rarely blue moon occasion. The last time they went for purely vacation together (well, minus S) wassssss in 2004 to Hakodate. Back to private phots-time. Aiba-chan wassssssss or is very very kakkoi! The glasses!!! So stylishly simple! J wasssssss sooooooooooo happy, all big smiles n taking pictures of members. Agree on most counts- what actually irked me about the BW shirt was the wrong grammar lol. But yeah, the goods this time round look great and had me forking my money faster than Sho runs away from snakes. I’ve already spent what little I made this month, and I have no regrets (but hopefully my parents never find out where the money went). This is marketing at its finest! IMO, the shirt design ended up so sad 😦 It’s like… “We don’t have enough time! Enlarge that album jacket shot and plaster it on a white shirt”. Lolz! I ended up purchasing the pouch and pamphlet. Whenever there’s Arashi concert, I make sure to buy the pamphlet since I love browsing through them. Ever since I bought all their photo books (“In a Rush” was my rarest find. Lolz! ), I want to look for old con pamphlets too but so far, I only managed to get the one from their winter tour and… The huge one with metallic color. 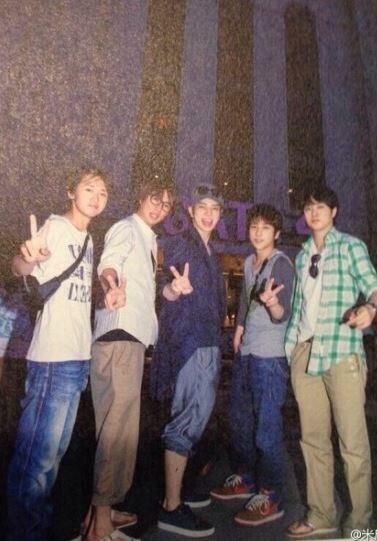 Forgot from what Arashi con it’s from. Lolz! The shirt is so fugly! I really don’t like it, but I totally understand your tradition! I don’t use uchiwas, they sort of freak me out. I don’t purchase photos because I’m not a fan of buying them either and they’ll eventually get scanned and posted somewhere on the internet. After seeing the goods list with prices, the only ones I even considered were the bag and pouches screamed me. Then I saw what they looked like! I took a loooong time, well more like the whole day yesterday, to contemplating whether I wanted to buy them or not. I eventually gave in and made a purchase for both. I pretty much had similar thoughts on the rest of the goods. I did really want the towel, but it’s just way too expensive. I probably would have bought it if I were in Japan. And I’m thinking the same thing about the pamphlet as you are about those NY photos! I LOVE (no pun intended) those private time photos! Totally worth the purchase, had I decided to shell out another $28USD, I couldn’t though. I felt guilty enough spending my money on the bag and pouches. Over the years I have learned to be practical with the merch I buy. I just read the BTS report on the merchandise and I like how they are so involved in the making if the products. I’m particularly happy they’re the ones who thought of the pouch as something that everyone could use daily. Hi, I don’t think the pouch has a long strap to convert it into a shoulder bag.